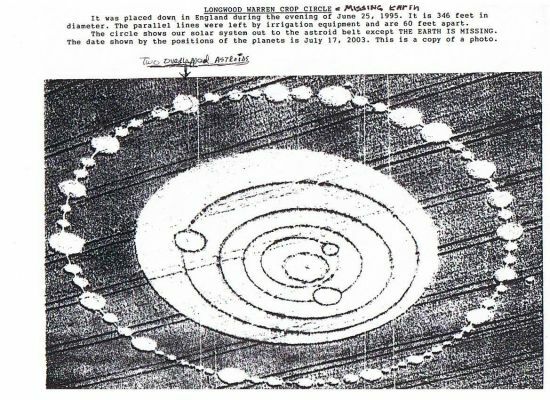 Missing earth crop circle showing overlapped asteroids. My original working paper. The field reports said 65 asteroids. I kept counting 64 until I spotted the two overlapped asteroids. The positions of the asteroids had to show when the event started. Only E-Ts could move two asteroids into the needed conjunction which will occur on July 16, 2024 about 16:08 UT. A time our astronomers can confirm. July 17, 2003 is the date shown by the remaining planets, the start of the 21 year countdown to our end. It was the July 17, 2003 date that stumped me. I could not understand how that date could rationally be the date of our end. I had always assumed the clock started tcking when the Barbary hit the ground. On July 12, 2012 I realized the E-Ts were showing us when the clock started ticking; i.e. "In seven three Earth year units of time Earth fries." Gorgeously elegant! It only took me 20 plus years to figure out. "In seven three Earth year units of time Earth fries." and the clock starts ticking on July 17, 2003. Its feels funny going back to when I finally figured out the date. WE got handed 12 more years, I got 12 more years. I promised myself I would never give up on trying to stop this, but it sure was nice to rest a bit.